"A 70-million-year-old fossil of a giant frog has been unearthed in Madagascar by a team of UK and US scientists. The creature would have been the size of a "squashed beach ball" and weighed about 4kg (9lb), the researchers said. They added that the fossil, nicknamed Beelzebufo or "frog from hell", was "strikingly different" from present-day frogs found on the island nation. Details of the discovery are reported in the journal Proceedings of the National Academy of Sciences (PNAS). The team from University College London (UCL) and Stony Brook University, New York, said the frog would have had a body length of about 40cm (16 inches), and was among the largest of its kind to be found. 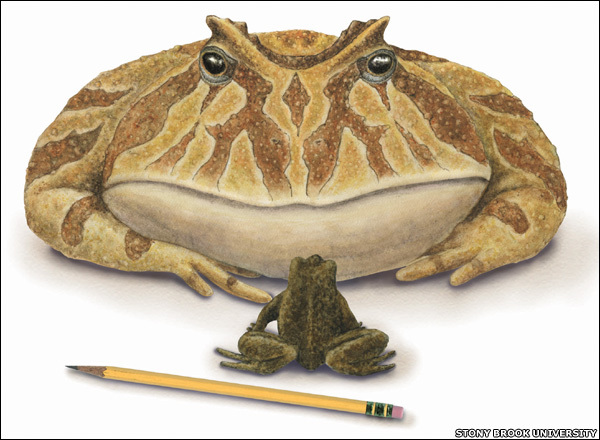 "This frog, a relative of today's horned toads, would have been the size of a slightly squashed beach-ball, with short legs and a big mouth," explained co-author Susan Evans, from UCL's Department of Cell and Developmental Biology. "If it shared the aggressive temperament and 'sit-and-wait' ambush tactics of [present-day] horned toads, it would have been a formidable predator on small animals. "Its diet would most likely have consisted of insects and small vertebrates like lizards, but it's not impossible that Beelzebufo might even have munched on hatchling or juvenile dinosaurs." The researchers added that the discovery of the fossil supported the theory that Madagascar and the Indian and South American land masses could have been linked until the Late Cretaceous Period (75-65 million years ago). "Our discovery of a frog strikingly different from today's Madagascan frogs, and akin to the horned toads previously considered endemic to South America, lends weight to the controversial model," Professor Evans explained."